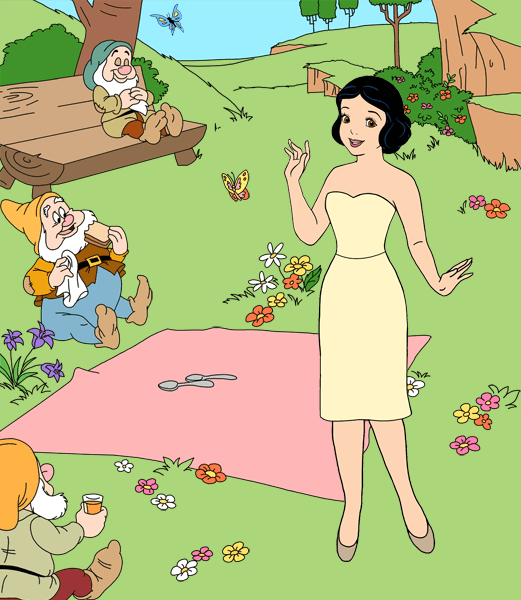 Dress up and make up Disney's Snow White as she enjoys a picnic on a clear summer day with Happy, Sleepy and Sneezy! Mix and match dresses, hair accessories, necklaces, baskets and more. Snow White was so named by her mother because her skin was as white as snow. When asked by the Evil Queen to name the "fairest one of all" the Magic Mirror simply answered: "Lips red as the rose, hair black as ebony, skin white as snow".